©1991 Sony Music Entertainment Inc.
Jerry Boy (aka Smart Ball in the west) is a cute platform game by Epic and published by Sony. The game starts when the young prince Jerry is about to marry the lovely Emmy. But things are about to change for the worse. Tom, Jerry's jealous brother, engages the services of a ruthless wizard and turns the poor prince into a blue slime. The young man escapes but gets swept away into the city sewage system. He then is most fortunately rescued by a kind old man - Jelly boy now embarks on a long journey to reclaim his identity and to find his lovely girlfriend. Jerry has the incredible ability to control his gelatinous body - he can flatten or stretch it to hit nearby enemies or stick to walls and ceilings. He can also swallow all kind of items usually found inside plants and use their unique properties - red balls can be thrown at the enemies (or collected for extra life), Iron balls can be used as a projectiles, green seeds can grow sort of beanstocks to climb on and so forth... The game has a lot more surprises in store such as the five letter flags that spell Jerry hidden in each area. Finally, every couple of stages, Jerry visits villages or towns - there he has the opportunity to talk to people and learn a bit more about what lies ahead. 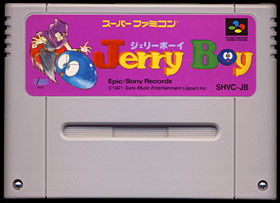 Jerry Boy was released in the US under the name Smart Ball. Unfortunately the entire introduction sequence was omitted as well as all the villages and towns Jerry visits along his journey. Hence the storyline was completely removed from the American version, I personally recommend anyone who want to enjoy the game in English to download the excellent English patch released by Chris Covell. 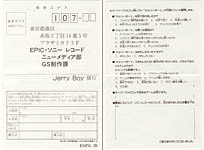 Jerry Boy or Jelly Boy ? Many players have questioned the spelling of the game. Shouldn't it be called Jelly Boy ? As you probably know, "ri" and "li" are spelled the same way in Japanese which could explain the confusion. But it seems to me that it was a deliberate pun. Jerry's brother is called Tom and this joke sorts of implies that the game designers knew what they were doing. 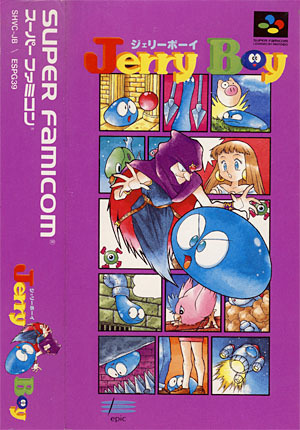 Something also worth mentioning (but not directly related) is the fact that another game called Jelly Boy was already available in Europe for the Super Nintendo system. It was released by Ocean in 1991 and it is a completely different game. 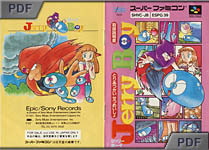 A sequel to Jerry Boy was planned for release but was eventually canceled (picture on the right). Jelly Boy 2 features a boy who has been turn into a slime as well as four of his friends. 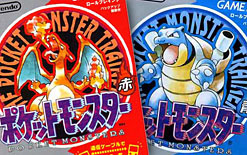 If has been since unofficially released as a ROM and was fan-translated by King Mike and Chris Clovell. There's plenty to love about Jerry Boy. The charming art design, the catchy soundtrack, the fun presentation - they all combine to make a game that could easily sit alongside the most popular classics of the genre. Despite having all the hallmarks of a true classic, Jerry Boy fell through the cracks of popularity. The game is full of nice surprises and little touches that other titles usually throw at you in the first couple of stages - here things keep coming and delight you at every turn. The moon stage (without spoiling it too much) was definitely a "wow" moment for me - and this probably half an hour into the game. The only downside of Jerry Boy is its lack of difficulty. You get lives thrown at you faster than you can lose them - but I personally don't mind as the game compensates for this lack by giving you countless stages to run through. Controls are also a bit "sticky" at times but nothing bad. All in all, Jerry Boy is a really fun and gentle game that has sadly gone widely overlooked.